No orange light it seems, though. *edit* I'm a idiot. Meh. It doesn't even make portals. It's just a fake. LAME. OK, I won't lie. It's freakin' amazing. Words cannot express how awesome that is. I'm serious. This guy just won the internet forever. If I posted here what I would to to get one of those, I would be banned and possibly arrested. I have already contacted the builder to find out how much he would charge to build me one. Tex, I'm going to be needing a wheel man for a "withdrawl" in the near future - you in? I saw that on Gizmodo and thought, "Don would like this." Oh, I plan on it. Just because of how incredibly epic this is. Even if he won't build me one, or more likely the price will be out of my range, the construction pictures he has online are extremely helpful. I have always planned on building one myself when I get the means... but this is even beyond even my lofty goals. OMFG, That thing is beyond cool, so amazing. And I want eeeeeeettt. So the deal is if he makes any more, it will only be a couple, and at $800 minimum and at least a month of building time. That's with basically no profit to him too, which is cheaper than I figured. But he does have a massive gallery of construction phase pictures I could get my hands on easier for when I have the space and means to make my own, so I'm working that angle. Drat, I was going to post this as well, found it on the Joystiq blog, but Big C's got me beat. Oh, and on topic, . How do you go about building something like this? Industrial design? That's what I'm going to college for! Yay! Hahaha. Cool. Awesome building skills. Tex, I'm going to be needing a wheel man for a "withdrawl" in the near future - you in? We split the take 50-50, and I get to carry the tommy gun. 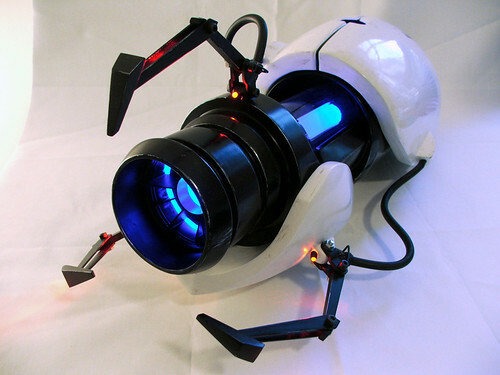 I know I may look like a big ignorant idiot right now, but what's a portal gun? Can someone provide me with a reference? It's the weapon of choice in Valve's video game Portal. what's a portal gun? Can someone provide me with a reference? EDIT : Ah! Thanks Jayfo! POrtal is, simply put, the greatest game ever made. In a nutshell, you wake up as a "test subject" in some vacant research facility, and you are being verbally guided through a series of mazes by a glitchy computer AI. The "portal gun" is the device you are given to get through the mazes and ultimately escape the lab. Unexpected hilarity ensues and a cult following was born. If you're the ready sort, check out the wiki page. If you're the watchy sort, check out the trailer for it on youtube. If youre the hands on sort with a high speed connection, you can download the demo straight from Valve. You're out of your friggin mind. Don't question me boy, I could have you banned just to point and laugh. That wasn't a question, that was a statement. I'm not even going to bother explaining the irrelevance of your quibble Maggy... and Jake, You don't need to try and explain why it's he best. It just is. man, you're quick for a zed!